One of the great applications for Serverless is using it as glue code between different services. You can spin up an endpoint to handle a webhook in seconds without bugging your company's Ops department. Github has a very mature webhook integration where you can be notified of a wide range of events. You can run a linter when a pull request is opened, send a notification when an issue is created, or trigger a deploy when a pull request is merged. In this tutorial, we'll show how to handle Github webhooks. We'll create a webhook that fires whenever our open-source repository is starred. Our handler for this event will post a celebratory message in a Slack channel. 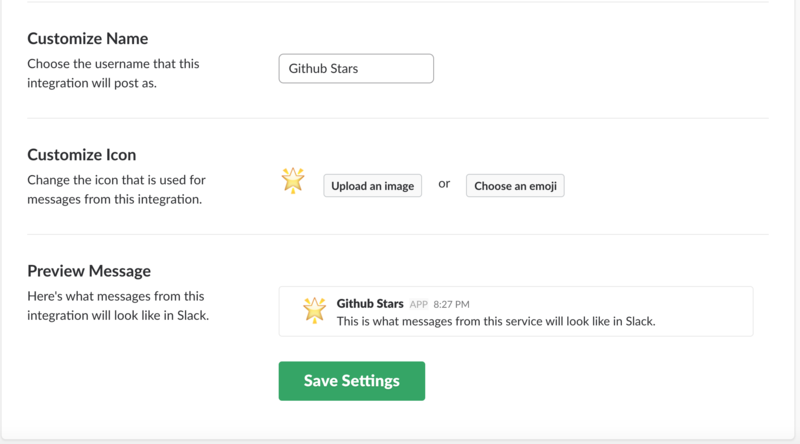 A Slack account where you have the ability to create apps. The first thing we'll do is set up an Incoming Webhook for a Slack channel. This will give us an HTTP endpoint to post messages that will be displayed in our Slack channel. Save this URL as you will need it in your Serverless function. Now, let's move on to setting up our webhook handler. In our handler, we'll want to parse the given event for the information we want, then send a formatted message to Slack using our webhook URL from the previous step. the URL to the user's Github profile. // Use getBody to check if there was an error. Let's walk through this handler code. 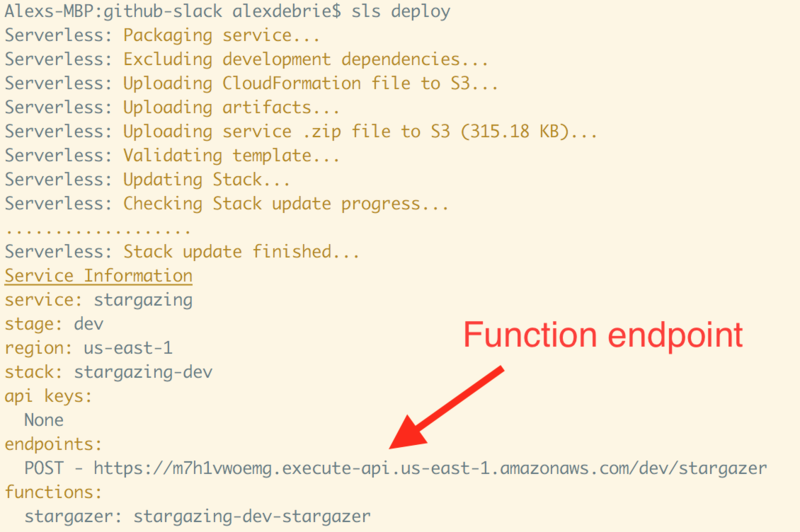 The exported stargazer function is the handler for our Lambda. This is what will be called when our function is triggered. In that function, we pull out the necessary elements of the webhook event, then use our sendToSlack function to assemble the message and post it to Slack. We should look at two other things before moving on. First, notice how we're getting the webhook URL from a WEBHOOK_URL environment variable. This is something we'll need to inject with our serverless.yml. In our functions block, we configure a single function, stargazer. We provide a path to our handler file and the name of the function to be triggered. Then, we set up an http event to be triggered on a POST request to /stargazer. Notice in the provider block that we've added the WEBHOOK_URL environment variable under the environment section. This matches with our handler code, which required our Slack webhook URL in the environment. Make sure to update that value with your URL from setting up your webhook. Serverless will print out a URL for your function to be accessed. Copy that URL as you will use it to configure your Github webhook. We're ready for the last step -- creating the Github webhook to send to our function endpoint. Then, go to the section to choose which events trigger the webhook. Click the "Let me select individual events" option, then choose the "Watch" event at the bottom of the list. Click the "Add webhook" button, and you're ready to go! Github will immediately send a test event to your endpoint. There will be a section showing "Recent Deliveries" and the status code, so you can see if you're having any failures. If you are, check the logs in your console with sls logs -f stargazer to find the errors. You did it! Quick and fun notifications of anytime a user stars your Github project. 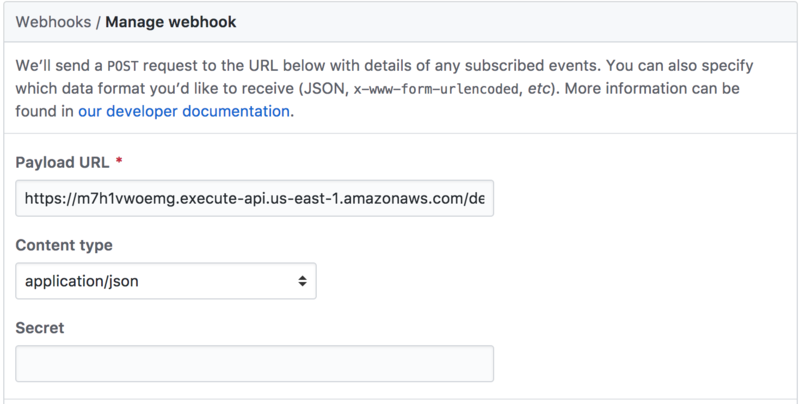 Check out the full range of Github webhook events -- you can implement some really powerful workflows with webhooks + Serverless. Let us know what you build! API World, the largest API conference, awarded the Serverless Framework the top honor for Microservices API! Going to re:Invent 2017? Here's our suggested track for getting the most info on serverless and Lambda.